Exagan, a start-up manufacturing gallium nitride (GaN) semiconductor technology for power electronics has begun a strategic partnership to develop and commercialize GaN-on-silicon products withHIREX Engineering, a company of Alter Technology Group (TÜV NORD GROUP’s Aerospace and Electronics Business Unit). 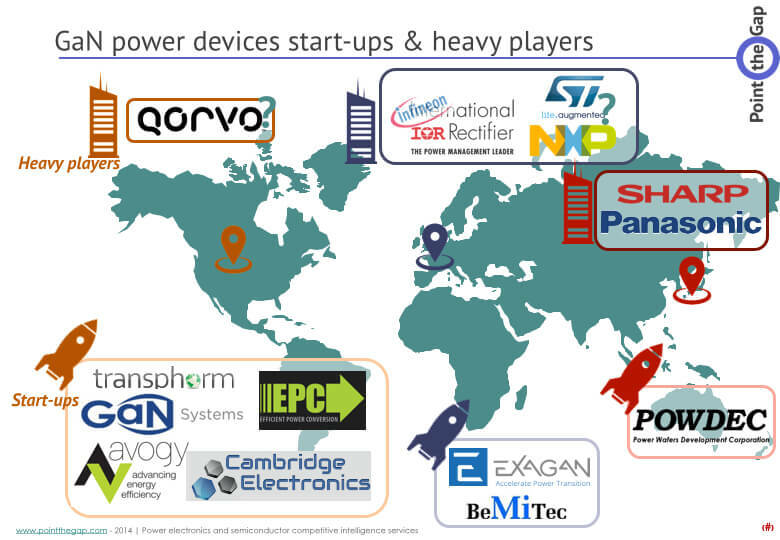 The partnership’s goal is to establish the reliability and quality of GaN-on-silicon power devices. Exagan will work closely with HIREX Engineering, a leader in reliability testing and qualification of ICs and discrete semiconductors for aerospace and industrial high-reliability applications. HIREX Engineering is located near Toulouse, France. Together, the companies will test and qualify Exagan’s G-FET™ products, which are fabricated with standard 200-mm silicon processing and proprietary G-Stack™ technology. G-FETs are used in making smaller, more efficient power converters that have a broad range of applications (plug-in hybrid and full-electric vehicles, solar energy, industrial applications, or charging of all mobile electronic devices). “This dynamic partnership will help to propel GaN market development by pioneering test methodologies and measurement processes that make it easier for makers of electrical converters to implement GaN in improving their products,” said Frédéric Dupont, president and CEO of Exagan. A collaboration between Pi Innovo’s electronics design and development expertise and GaN Systems’ gallium nitride (GaN) semiconductors, offers automakers a pathway to the electrification of auxiliary systems for multi-voltage conventional, hybrid-electric, and pure electric vehicles. Based on GaN Systems’ technology, gallium nitride devices use GaN-on-silicon base wafers. The company manufactures a range of gallium nitride power transistors for automotive, consumer, datacenter, industrial and solar/wind/smart grid applications. 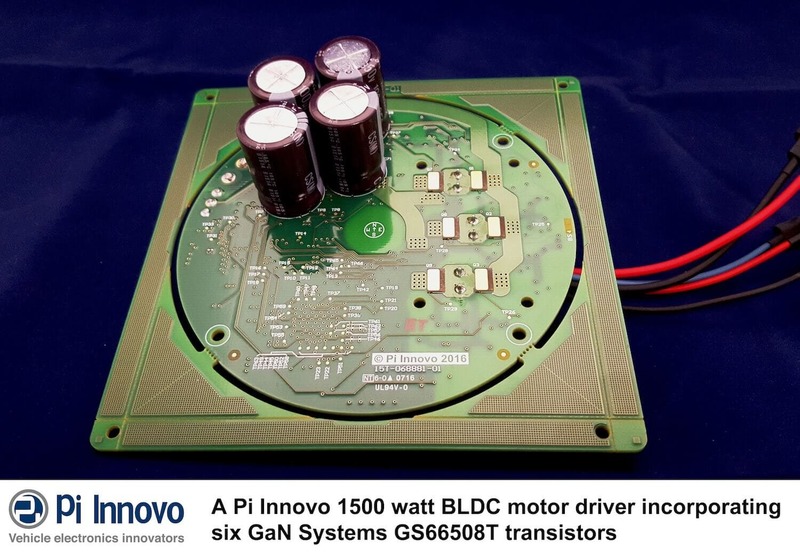 Pi Innovo has designed and implemented custom motor control electronics to take advantage of the benefits of GaN Systems semiconductors in applications with a range of input voltages from 12V to 300V. This controller design provides a functional starting-point for the development of 48V and above, high-speed motor-driven vehicle systems, and adds to a growing portion of Pi Innovo’s business providing custom electronics solutions across multiple markets. Following the success of this GaN-based multi-voltage motor controller development project, Pi Innovo is now offering design and development services in support of customers looking to adopt this technology for a wide range of electronics design applications in automotive and adjacent markets. The company is positioned to support customers wanting to develop prototype evaluations to quantify the benefits of GaN technology. Pi Innovo can also provide customized cost effective high volume designs for customers looking to go into production. said Dr. Walter Lucking, CEO of Pi Innovo. As part of the company’s strategy to move more significantly into power semiconductors for industrial and automotive markets, Littelfuse has made an investment in Monolith Semiconductor, Inc., a start-up company developing silicon carbide technology. Silicon carbide is a rapidly emerging semiconductor material that enables power devices to operate at higher switching frequencies and temperatures versus conventional silicon. This allows inverters and other energy conversion systems to be built with significantly improved power density, energy efficiency and cost. said Ian Highley, Littelfuse Senior VP and GM, Semiconductor Products, and CTO. Initially this is not a material investment for Littelfuse; however, the company has committed to add to its investment once Monolith has achieved certain milestones. This investment is not expected to have any material financial impact on Littelfuse in 2015 or 2016. Founded in 1927, Littelfuse is the world leader in protection with growing global platforms in power controls and sensing. The company serves global customers in the electronics, automotive and industrial markets with technologies including fuses, semiconductors, polymers, ceramics, relays and sensors. Littelfuse has over 8,000 employees in more than 35 locations throughout the Americas, Europe and Asia. For more information, please visit the Littelfuse website: Littelfuse.com. Monolith Semiconductor Inc., a Round Rock, Texas-based startup company, is focused on improving the affordability and reliability of SiC power devices by utilizing advanced manufacturing techniques and high-performance processes and designs. For more information, please visit the Monolith Semiconductor website: monolithsemi.com. GaN Systems, the manufacturer of gallium nitride power transistors, announces that its foundry, Taiwan Semiconductor Manufacturing Corporation (TMSC), has expanded the volume production of products based on GaN System’s Island Technology® by 10X in response to demand from consumer and enterprise customers. GaN Systems has the industry’s broadest and most comprehensive portfolio of GaN power transistors with both 100V and 650V GaN FETs shipping in volume. Using Island Technology with TSMC’s GaN-on-Silicon manufacturing techniques enabled GaN Systems to deliver the most usable, high performance, normally-off transistor to the market in mid-2014. This has allowed global power system manufacturers in the energy storage, enterprise and consumer markets to design, develop, test and bring to market more powerful, lighter and far smaller new products in their quest to attain competitive edge. To meet customers’ increasing demand for high GaN volumes in 2016, TSMC’s commitment to volume production flow comes at the perfect time. Rohm has recently announced the development of a 1200V/300A full SiC power module designed for inverters and converters in solar power conditioners and industrial equipment. The high 300A rated current makes the BSM300D12P2E001 suitable for high power applications such as large-capacity power supplies for industrial equipment, while 77% lower switching loss vs. conventional IGBT modules enables high-frequency operation, contributing to smaller cooling countermeasures and peripheral components. In March 2012, ROHM began mass production of the world’s first full SiC power module with an integrated power semiconductor element composed entirely of silicon carbide. In addition, its 120A and 180A/1200V products continue to see increased adoption in the industrial and power sectors. And although further increases in current are possible due to energy-saving effects, in order to maximize the high-speed switching capability of SiC products, an entirely new package design is needed that can minimize the effects of surge voltage during switching, which can become particularly problematic at higher currents. In response, the BSM300D12P2E001 features an optimized chip layout and module construction that significantly reduces internal inductance, suppressing surge voltage while enabling support for higher current operation up to 300A. And going forward, ROHM will continue to strengthen its lineup by developing products compatible with larger currents by incorporating SiC devices utilizing high voltage modules and trench configurations. Wolfspeed, the new spin-off from Cree, that makes silicon carbide (SiC) and gallium nitride (GaN) wide-bandgap semiconductor devices, has launched what it claims is the industry’s first 1700V SiC MOSFET offered in an optimized surface-mount (SMD) package. The higher blocking voltage enables design engineers to replace lower-rated silicon MOSFETs with the new SiC MOSFETs, delivering higher efficiency, simplified driver circuitry, and lower thermal dissipation, and resulting in lower total system costs, says the firm. The new SMD package, specifically designed for high-voltage MOSFETs, has a small footprint with a wide creepage distance (7mm between drain and source). This is made possible by the small die size and high blocking capability of Wolfspeed’s SiC planar MOS technology. The new package also includes a separate driver source connection, which reduces gate ringing and provides clean gate signals. claims Edgar Ayerbe, marketing manager for power MOSFETs. “Due to the lower switching losses of silicon carbide, the devices operate at much lower junction temperatures. This enables customers to directly mount the devices onto the PCB with no additional heat-sinks, which greatly reduces the manufacturing costs and improves the reliability of the systems,” he adds. Application of the new 1700V SiC MOSFET is anticipated in auxiliary power supplies within high-power inverters — such as solar power inverters, motor drives, uninterruptible power system (UPS) equipment, wind-energy converters, and traction power systems — which typically buck down DC voltages to operate system logic, protection circuitry, displays, network interface, and cooling fans. They can also be used in the power supplies of three-phase e-meters, or in any converter application that requires high blocking voltages and low capacitance. Designated the C2M1000170J, the new 1700V SiC MOSFET features an avalanche rating greater than 1800V, and an RDS(on) on-resistance of 1Ω. These characteristics ensure reliable performance in flyback converter circuits, including those in noisy electrical environments such as those found in high-power inverters, says Wolfspeed. By enabling the design of single-switch flyback topologies from input voltages spanning 200V to 1000V, the 1700V SiC MOSFET simplifies the complex drive and snubber circuit elements required for silicon devices, the firm adds. The C2M1000170J is fully qualified and available for sampling now. Ascatron AB, supplier of silicon carbide (SiC) epitaxy material, and LPE SpA, a pioneer in epitaxy reactors for power electronics, have entered into a cooperation agreement to develop high performance SiC epitaxial material for volume production on 150 mm substrates. The first results demonstrating outstanding uniformity will be presented at the ICSCRM2015 conference in Catania. Ascatron has installed a new SiC epitaxy reactor supplied by LPE in its production fab in Kista-Stockholm. The reactor system with 150 mm wafer capability has the model name PE106. It is a new development from LPE and has recently been introduced on the market. 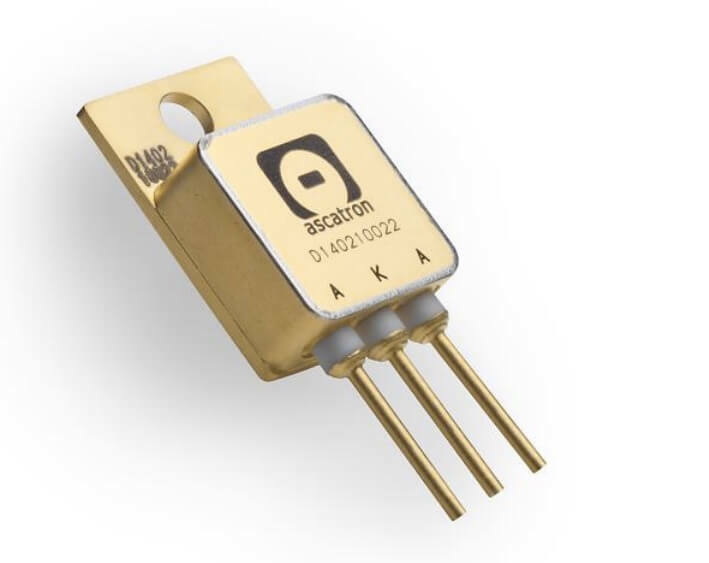 Industry shortest cycle time and smallest footprint makes it an optimal choice for production of Ascatron’s high quality epitaxial material for high voltage power devices. ,says Christian Vieider, CEO of Ascatron. “We are now ready to provide our customers with n-type doped epi wafers with thicknesses from 0.1 µm up to 100 µm”. “The new PE1O6 will further enhance Ascatron unique epitaxy based SiC technology, which is set to gain worldwide acceptance among device makers because of its superior features”, according to Franco Preti, CEO of LPE. “The cooperation with Ascatron enables LPE to strengthen our position on the market even further”. “The single wafer concept of the LPE reactor is ideal to optimize growth parameters for a wide range of processes”, says Adolf Schöner, CTO of Ascatron. “We are now able to establish our unique growth processes for embedded pn junctions and 3D structures on this 150 mm wafer platform, which is a crucial step towards cost effective production of next generation SiC power devices”. Panasonic Corporation today announced that it developed gallium nitride (GaN) diodes that can not only operate at a high current that is four times greater than that tolerated by conventional silicon carbide (SiC) diodes*1, but also operate at low voltages by virtue of their low turn-on voltage. Production of the new diodes was made possible via a newly developed hybrid structure composed of separately embedded structure comprised of a low-voltage unit and a high-current-capable unit, in preparation for high voltage conditions. Conventional silicon (Si) diodes are limited with regard to reducing switching losses. On the other hand, diodes based on SiC, a compound that is considered as a promising next-generation power semiconductor, as well as GaN, require an increased chip area to achieve high-current operations, thus posing limitations on the reduction of switching losses and size owing to increased operating frequencies. The newly produced GaN diodes have achieved simultaneous high-current operations and low threshold voltage, and thus can handle high currents even with a small chip area. The capacitance of the chip can therefore be reduced to achieve lower switching losses, allowing the device to operate at higher frequencies. As a result, use of GaN diodes in the voltage conversion circuits or inverter circuits of automotive or industrial equipment that requires high power can reduce system size due to high frequency operation. This newly developed product has the following advantages. The diodes were created based on the following technologies. 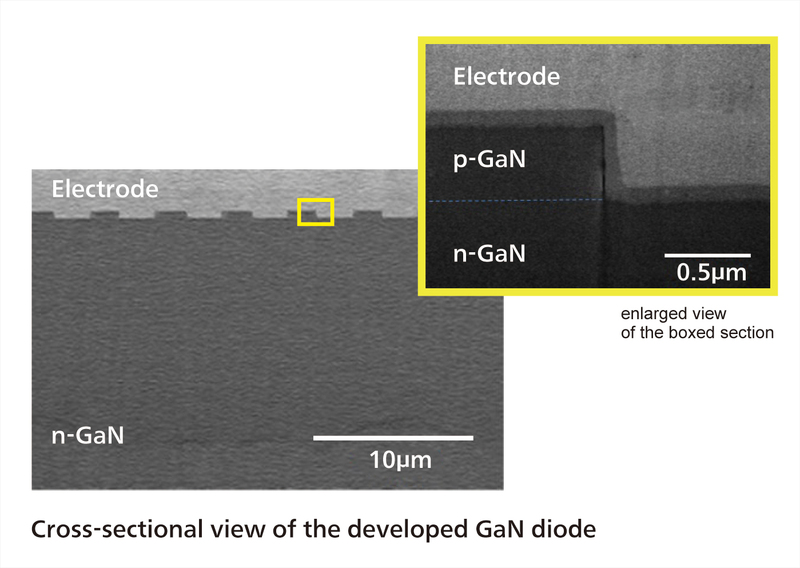 We proposed a hybrid GaN diode with a p-type layer in which trenches are formed, and developed a processing technology that can remove a p-type layer on an n-type layer in a selective manner to achieve not only high-current operations and a low turn-on voltage but also a breakdown voltage of 1.6 kV. For this development, we used conductive GaN substrates with a low resistance, which have been commercially used in LEDs and semiconductor lasers and are expected to be adopted in power devices in the future, and established the technologies for the epitaxial growth and processing on a GaN substrate before forming diodes. A structure in which currents flow in the vertical direction enables a smaller chip area and lower resistance. This work was partially supported by the Ministry of the Environment, Government of Japan. The results of this development were presented at the 2015 International Conference on Solid State Devices and Materials , Sapporo, Japan (September, 2015).